Roman Miscellany: I Am 3! I was ordained three years ago today - the Feast of Our Lady Help of Christians (and Empire Day). At first I slightly resented being on a conference for my anniversary, which is a bit like a second birthday and should therefore be a day of celebration and thanksgiving (last year I was in France). However, it turned out to be a real blessing. His Feast, of course, is on 25 May and, since this was the day after my Ordination, I chose him as my priestly patron. This, incidentally, is a good thing to do when one approaches Ordination. Ronald Knox, for example, chose St Hilary of Poitiers and took the name in much the same way as taking a name at Confirmation. 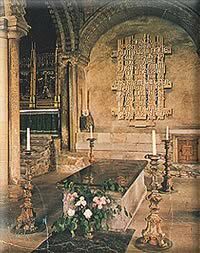 As I was leaving the Cathedral, by the way, I bumped into a priest I had known in Rome and who is now studying in Durham - he said that he (and another Catholic in Durham) reads this blog! Like Allen Hall (our seminary in London), Ushaw claims descent from the English College, Douai, which provided an overseas education for Catholics during 'Penal Times' and was a seedbed of many martyr priests. In the aftermath of the French Revolution, it established itself at Ushaw in 1808 and became a cradle of the 'Second Spring.' The great Catholic historian, John Lingard, was on the staff here, and students included the future Cardinals Wiseman and (later) Merry del Val. It's a place where you can't but be aware of centuries of faith and tradition! In many ways, I was very impressed by Ushaw - the beautiful chapels, the rolling grounds, the interesting episcopal portraits, the peaceful cemetery (one of the first Catholic ones in this country since the Reformation) where the bishops of Hexham and Newcastle are traditionally interred and the recurring motif of rabbits (which formed part of Cardinal Allen's coat of arms - there's even a painting of 'Our Lady of the Rabbits'). However, today Ushaw survives more from being a conference centre than a seminary. There are currently 16 students and we hardly saw them during our stay. This is worrying, especially given the vast size of Ushaw and its status as a regional (not a diocesan) seminary. We pray that the Lord will send more labourers into the harvest in the North and that nothing will stand in their way to serving Christ and His Church. Prayers and Blessings to you today, Fr. Nicholas, on your 3rd year of ordination. May you continue, with joy, doing Christ's work. 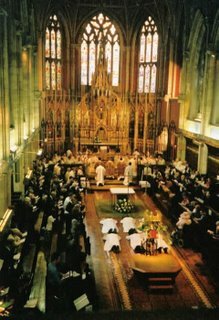 Not to mention Ushaw's collection of relics in the Holy Family chapel, which is reputedly the largest in a single collection outside of Rome; the cassock of Pope St Pius X in his cloister chapel; the beautiful mortuary chapel with its ceiling bosses which outline a theology of the propitiatary nature of the Mass; the 300+ acres of surrounding land belonging to the College, etc etc. Ushaw is a marvellous place. I pray hard for a fresh out-pouring of the Spirit there and for a growth in vocations. 16 seminarians is very sad when you consider that those 16 serve 7 dioceses and are spread out over 6 formation years! We pray that they be given the grace to persevere. Yes, it IS a great place and I'm glad it's found some form of new life through the Conference Centre. I didn't realise that the relic collection was allegedly the largest outside Rome. The cabinets in the chapel were not open, though I could just make out part of the skull of St Cordula (a companion of St Ursula). Also, the cassock of St Pius X, donated by Merry del Val, has been removed from the chapel because of damp.